Duct tape comes in a rainbow of colors and patterns these days, but you'll most likely require the white version to hide holes or cracks in the skirting around your porch or mobile home. This quick fix is a much cheaper alternative to replacing the damaged panels, especially since the skirting never gets a close look by anyone. City dwellers know all too well how easy it is to have a side-view mirror knocked off overnight. Sure, you can call your insurance company when it happens, but then you're faced with paying the high deductible and a potential fee increase to your policy. If you don't have the money to handle the situation yourself, consider reattaching the mirror with duct tape. The hack won't pass inspection in all states, so if you encounter this crisis, investigate with your state motor vehicle department before making the fix a long-term solution. A strip of duct tape on the stairs can potentially save a life, according to the caregivers at SYNERGY HomeCare, who use the technique in clients' homes. "A simple strip of colorful duct tape on the edges of stair steps makes it easier for seniors to judge the depth and distance to keep from tripping and falling," says a spokesperson for the organization. Staircases and stairway accidents are one of the leading causes of accidental injuries — second only to motor vehicle accidents. Each year 12,000 people die from stairway accidental deaths, many of whom are seniors. This is an easy, cheap way to prevent accidents and possibly save lives. To keep strips of sandpaper from tearing when sanding rounded surfaces, apply duct tape to the back of the sandpaper before cutting it into strips. If you have chairs or other furniture scratching your floors, wrap the feet in small strips of duct tape. This works particularly well for furniture on wheels, since you can't buy pads for these items like you can for your flat-footed furniture. If you have a stubborn jar whose lid won't open easily, create a simple solution with about a foot of duct tape. Fold three or four inches of it around half of the lid then use the remaining eight inches to pull the lid counterclockwise. The gripping action of the duct tape should open it right up. I have a hypoallergenic dog specifically because I can't stand pet hair. It's bad enough when it's on my clothes, but it really grosses me out when it's all over my bed. If you have either of these problems, an easy way to remove the pet hair quickly and efficiently is to apply duct tape to a paint roller with the sticky side facing out. It's bigger than a regular lint roller, so it's great for large surfaces. Of course, you can spot clean the pet hair by hand with duct tape, but you'll cover much more surface area in less time with the roller. Small leaks in hoses — indoor and outdoor — can be stopped with duct tape. Don't, however, take this advice to mean that you can solve all plumbing problems with duct tape. That's not a good idea. If you have a major leak or other plumbing issue, contact a professional. 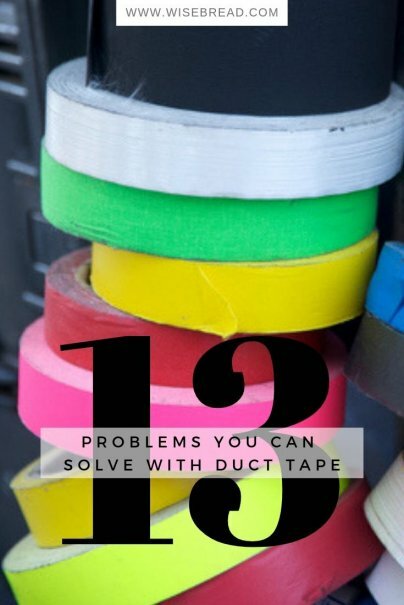 Unlike repairing plumbing pipes, you can probably successfully plug a hole in your ductwork with duct tape. At least in this case, you have the advantage of only spilling air, whereas a water leak can become a real disaster. Why buy a new trash can if all you're putting in it is rubbish? Granted, duct tape probably won't prevent squirrels from getting into your trash bins — they've eaten holes straight through the very hard plastic my garbage cans are made of. I'm all ears to your solutions to that problem. A friend of mine does a lot of walks for cancer research — often dozens of miles over the course of a few days — and she told me that she covers her shoes in duct tape, around the sides and over the top – to keep them from getting wet and uncomfortable in inclement weather. Smart idea. Small shards of glass and metal are hard to see and sweep. To ensure the complete cleanup of the debris, do a thorough sweep or vacuum then pick up any remaining bits with a strip of duct tape. Out of all duct tape's problem-solving uses, first-aid is the most important. Duct tape can stop bleeding, clean wounds, close wounds, keep wounds dry, and even prevent a collapsed lung. Certainly it's not the ideal method of care, but if it's the only thing you have on hand in a life-or-death situation, you'd better reach for it.